Restriction enzymes are endonucleases that recognize and cut double-stranded DNA within or near defined base sequences. They are essential tools for biotechnology. 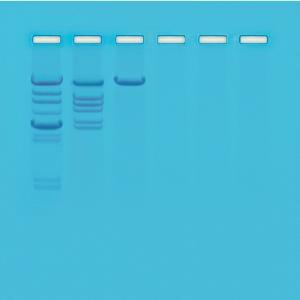 Experiment contains several DNAs digested with various restriction enzymes to demonstrate patterns and frequency of cleavage. Digests are separated by agarose gel electrophoresis. Include materials for six student groups to run six gels of six lanes each. Requires, but does not include horizontal gel electrophoresis apparatus, DC power supply, and automatic micropipets with tips.